SMART Board interactive whiteboards—which combine the functionality of a computer with the simplicity of a whiteboard—are rapidly becoming fixtures in classrooms, boardrooms, and lecture halls everywhere. While these high tech devices are transforming the ways we teach and learn, getting the most out of them can be down right intimidating. SMART Board® Interactive Whiteboard For Dummies is here to help, explaining everything users need to know to make the most of their technology. Covering topics including how to calibrate a SMART Board interactive whiteboard using a computer, navigating software options, creating interactive presentations and lesson plans, incorporating sound and animation, managing content, and using digital ink with the touch of a finger, the book is designed to get your interactive whiteboard up and running in no time. 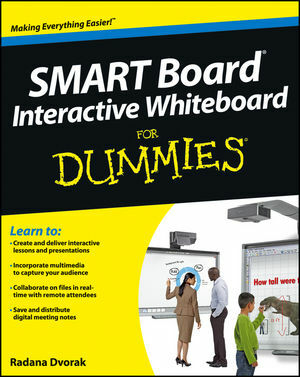 The go-to guide for anyone working with SMART Board interactive whiteboards, SMART® Board Interactive Whiteboard For Dummies is designed to make using the chalkboards of the twenty-first century a cinch. Radana Dvorak holds a PhD in Computer Science from the University of London, Queen Mary College, and a master's degree in Knowledge Based Systems (AI). In the past, Radana has served as a researcher and professor, as well as heading a software company that designs software tools. Currently, Radana is the Associate Dean for Extended Learning at Saint Martin's University. She is the author of Moodle For Dummies.